One thing I absolutely love is working with amazing independent retailers and companies. I have fallen in love with TLC Woodcrafters over the past year, and am honored to be sharing yet another of their fantastic, personalized, wooden products with you today. My family and I were blessed with an Heirloom One Name Puzzle Stool to review, and we are so impressed with the quality and craftsmanship of this product! Harrison, our nine month old, was the lucky recipient of this name puzzle stool. He LOVES it! 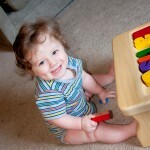 Not only does the stool look terrific in his nursery, but he truly enjoys playing with it! Harry will sit and play with the letters from the stool for long stretches of time! 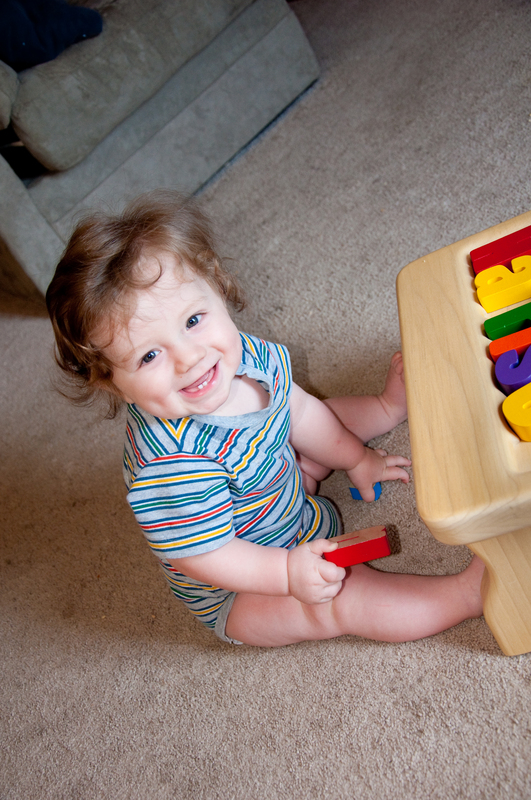 The large, easy to grasp pieces make playtime accessible for little hands. TLC Woodcrafters uses raised lettering in all of their pieces, making their personalized items truly child-friendly. 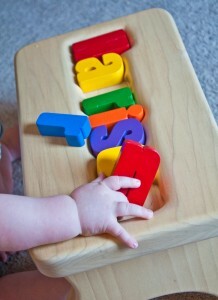 Even with his tiny baby hands, Harrison can easily pick and place each of the letters from his name stool. Aren’t the bright colors amazing? I love the way they look set against the beautiful natural finish of the quality hardwood. The stool is so beautifully sanded and smooth, with gorgeous rounded edges (yay for safety!) and are extremely sturdy and built for maximum stability! (My husband and I can stand on the stool without it going anywhere!) These stools are built to last, and will not only stand the test of time, but will hold up to the toughest of toddlers and years of childhood play and use! Check out this adorable video of our little Harrison in action with his very own name puzzle stool from TLC Woodcrafters!! Your child, no matter the age, will LOVE seeing a product personalized with THEIR name! Kids are egocentric by nature, and love to see their name in print. Having something that they can tangibly touch and feel with their name on it, will not only delight them, but will help promote early literacy skills. 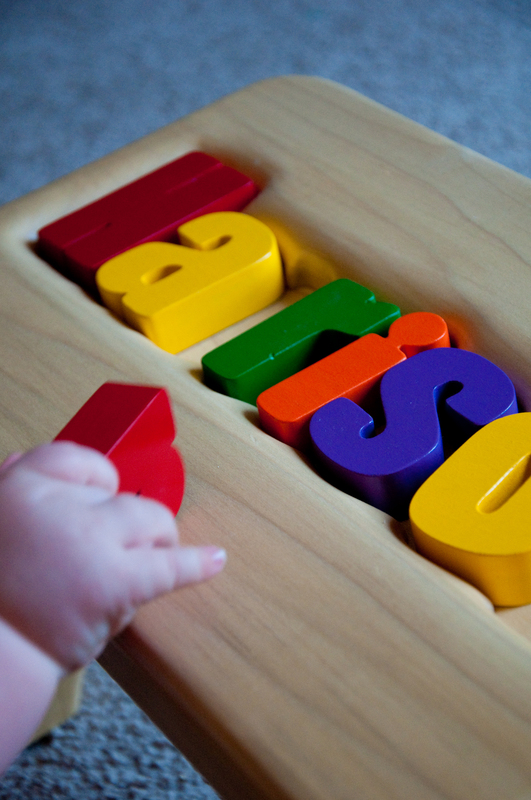 Your child will be able to practice and learn the letters of their name from a very early age. Even very young children will learn to recognize their full name in print (written the correct way as well!) I love the literacy/alpha-recognition tie-in that accompanies all of the work TLC Woodcrafters does. You have a chance to purchase one of these GORGEOUS stools for someone special directly from TLC Woodcrafters! These stools are made to order just for you, and are truly made with the highest degree of care and personalization. This company offers a wide range of options to further personalize your stool, such as the ability to choose primary or pastel lettering, the color of your stool base, and the option to add your child’s favorite character, or an engraved message! SO many options and endless possibilities abound when you work with the creative and caring folks at TLC Woodcrafters. I KNOW you will be impressed with the work this husband and wife team do. PLEASE head on over to their website and check out their stools!! I WANT TO BUY A STOOL!!! Right now you have the chance to win a personalized Smurfs puzzle from TLC Woodcrafters! Enter to win HERE!!! I WANT TO WIN THE PUZZLE!! Stay tuned when next month, you’ll have the chance to win a name puzzle stool of your own!! Until then, head on over to the TLC Woodcrafters homepage and BUY ONE!!! Such a cute video–he sure does like the blocks.